← So What’s the Point? What Lasting Impact Does Helms Make on My Understanding of the Gospels? I never gave much thought to the “completeness” of the Bible. Until I’d read it, I wasn’t even aware of what was in it, much less have a sense of what might have been taken out. I did know enough that King James revised the good book in order to make his (married) life easier, but it never occurred to me that there might have been a lot of material that had been intentionally omitted at some point in history. The Apocrypha consists of the books that are found in the Greek version of the Jewish Bible–the Septuagint, the earliest complete version of the Bible we possess–but that were not included in the final, canonical version of the Hebrew Bible. I like the idea that I get to read more of the story-type books I enjoyed in the Old Testament. If this is true, why have they been left out? I can get my hands on this book so anyone else can as well. But if they’re part of the story, shouldn’t they be respected as such by being included? 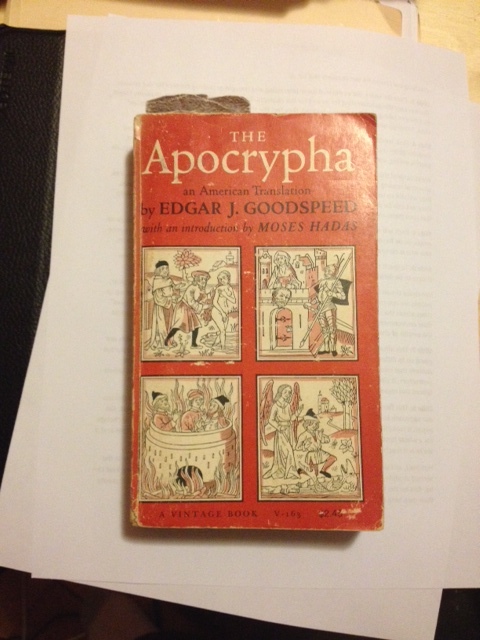 The Bible Project continues with my reading of The Apocrypha, translated by Edgar J. Goodspeed. This entry was posted in The Apocrypha and tagged Books of the Bible, Brad Windhauser, The Apocrypha. Bookmark the permalink.